This app was previously called "Archiving Plugin for Confluence". It is still the same app you love, but it was renamed in Sep 2018. 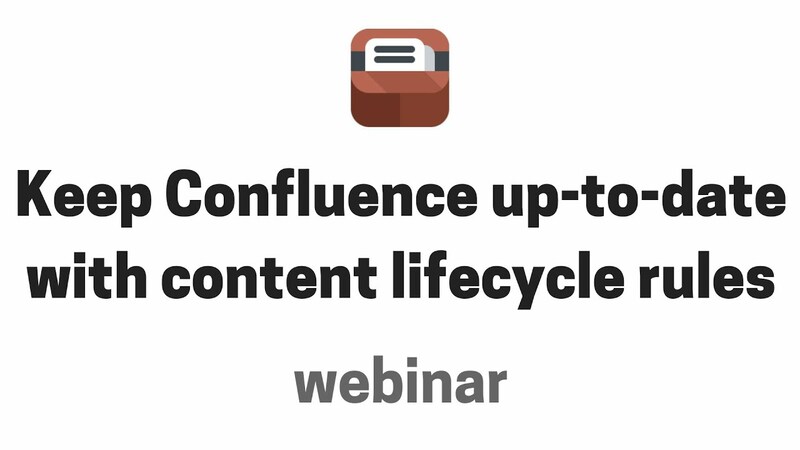 The Better Content Archiving app implements complete Content Lifecycle Management for Atlassian Confluence, to keep your content clean, up-to-date and relevant at all times. Different types of content have different lifecycle. Let's see a few examples! Monthly sales report pages need an update by the Sales Manager every 30 days. Quarterly goal lists can be moved away on the 10th day of the new quarter. Product manual pages not viewed by anyone for 500 days must be reported to the Technical Documentation leader. Intranet content created 3+ years ago and not visited for 365+ days can be silently archived. Meeting notes never require an update. All these scenarios and more and supported via straight-forward lifecycle rules, that are executed periodically in the background. The status of each of piece of content triggers automatic mechanisms like quality reports or notification emails. Read on. Know the currency, validity and quality of your technical documentation, intranet pages, knowledge bases, records and any other content type. Set up trigger-action based rules to keep reviewers involved in the process. When some pages reach their end-of-life, archive those to hidden spaces. Never delete. Confluence makes it easy for everyone to contribute to content, and that's a great thing. The difficult part is to keep content current and relevant, and that leads to every sort of costly problems. Seriously, should that old how-to related to Android 2.x appear in your documentation? Prevent loosing valuable wiki pages among unused content. How many hours and dollars have you wasted due to inaccurate information? Don't #@!% the customer and your team members with outdated documentation. Reduce the volume of growing, uncontrolled information. Authors, last modifiers, admins and supervisors can be automatically notified about the unused and expired wiki pages. Just click the "edit" link in the email and update the page. This is really that fast. Keep your team focused on what is important. Archived pages can be viewed, searched or restored any time later. Default theme? Documentation theme? Brikit theme? Enterprise theme? Linchpin theme? Refined theme? Grab a cup of coffee and watch this webinar recording. We will walk you through the app features in just 45 minutes to make your app trial faster and more comprehensive. After watching this video, start your free trial! Your Confluence spaces are polluted with expired pages, content to be reviewed and unused pages. It confuses your users, wastes resources and needs a major clean-up. The app finds all expired pages and notifies stakeholders, encouraging an update. The pages getting an update become current and reliable again. The pages not getting an update are automatically archived by the app to a background archive space. Archive spaces allow restoring, viewing or searching archived content, but they do not appear in searches, navigation and dashboards. 4: Confluence is clean again! Woot! You get all the benefits above. Better Content Archiving continues to run in the background, making sure that the chaos never returns. We had been needing a solution like the Better Content Archiving app for years, as our knowledge repository surged past 1 million pages and 1,000 spaces. When we first discovered the plugin we were happy because it did most of what we needed. Thank you Midori! This is a great plugin. It helps us tell the story of how well we are maintaining our team info, checklists and self-sourcing information for our internal customers. We used it to keep ourselves honest about the currency and accuracy of our data too. 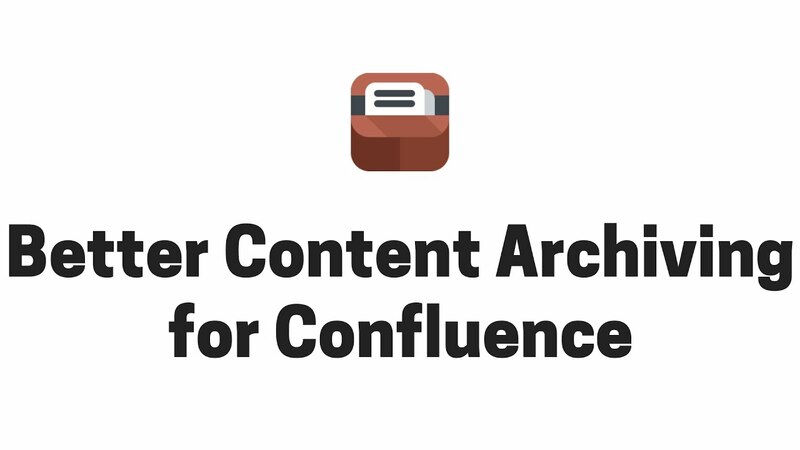 Better Content Archiving for Confluence takes the pain out of ensuring that large Confluence instances stay fresh, which aids user adoption and discovery of good content. It's like having a robot as your Wiki Gardener! Fantastic service! I reported an issue archiving a space with 2,588 pages with 57% out of date on SQL Server 2008. Ferenc at Midori re-engineered the code overnight(!) to handle the SQL Server limitation. Now that's a way to inspire customer loyalty! This add-on serves a very useful function that isn't native to Confluence. It makes the task of scouring through your intranet a thing of the past. The Youtube tutorials available in their user guide section are also very helpful.